This section that describes the TruRating application for payment devices applies to all contexts where the customer is present in a merchant outlet and pays for their custom at a till at which a card payment device is present. This contrasts with online purchasing, where the TruRating Online may be used to receive customer feedback. Note that in this case the customer does not need to pay with a card - but the payment device will be used to present the TruRating question. When present at Point of Sale (POS) systems, the TruRating application can be integrated with the Payment application, the POS application or may run independently as a middleware component. The TruRating question should be displayed on the payment or PIN entry device (PED) which is normally controlled by the payment application and so some level of support within the payment application is typically required. Before getting started take the opportunity to review our customer journeys matrix for a summary of the different ways in which the TruRating experience can be delivered in both Standalone, Semi-Integrated and Integrated payment environments. The TruRating Solution consists of two components: TruModule and TruService. TruModule is the component that is integrated either into the Payment Application or POS Application and is written by the Application Provider. It interfaces to the TruService that encapsulates all the TruRating business logic and runs as a service. TruService is specified and developed by TruRating. A typical logical architecture for a TruRating integration is shown in the following figure. Note that in this example TruModule is part of the payment application, but see the design patterns for descriptions of alternative architectures where TruModule may be part of the POS application, or in a middleware component. A payment application runs in the store either on the till or on the payment device. It may expose an interface to the point of sales application (POS), allowing it to be automatically invoked at the end of a transaction to process a payment of a given amount. It has a component that drives the card payment device including the screen display and the keypad. It also needs a network interface to the payment authorisation service provided by the acquiring bank. A TruModule is added to the payment application as a new component in order to provide TruRating services. It is notified of various events occuring during the customer transaction, which may include events occuring within the POS application if the POS interface supports them. 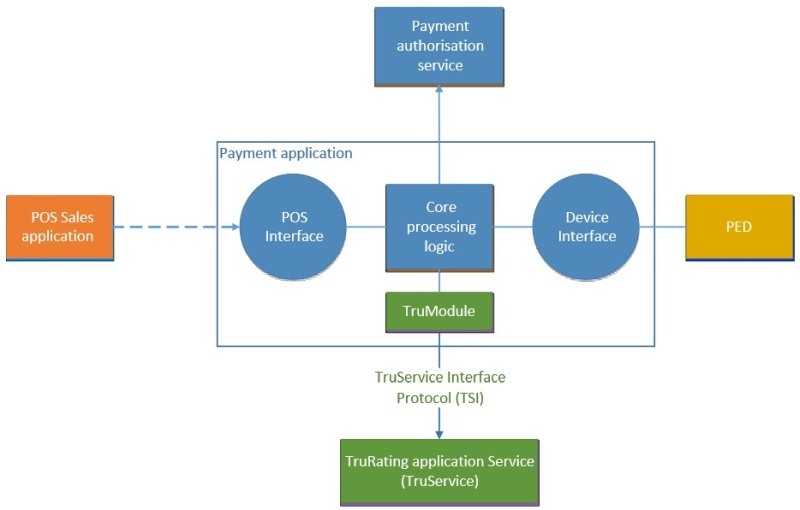 In response to a particular event the TruModule requests a question from TruService, uses the device interface to display the question on the payment device and capture the result. The resulting rating record including some transaction data is delivered to TruService, generally at the end of the transaction. TruService is responsible for delivering the rating records to the central TruRating system, from where they will be processed to provide the rating analytics back to the merchant.